The Safetots Ultimate Balance bike is produced by Safetots, who are a leading British company that offers a range of quality services and products for babies and children. The Safetots Balance bike has an unspectacular, yet solid appearance on first viewing, with a steel frame, horse shoe saddle and spoked wheels which improve the look of the bike and improve the flexibility to help the learning process. As with most steel balance bikes, the Safetots Ultimate Balance bike is equipped with a fully adjustable saddle and handlebars so you can change the height as your child grows. However, although this bike is advertised as being suitable for children age 2 through to 5 – the lowest seat height on this bike is around 39cm which will make it too big for most 2 year olds as they will most likely require a seat at around 29cm. 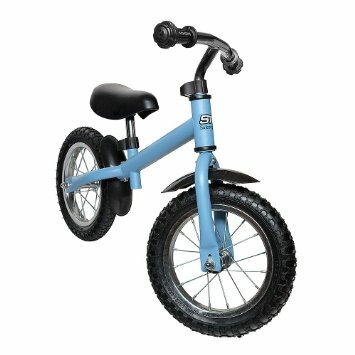 We have full guides for the best balance bikes for 2 year olds as well as recommended balance bikes for 3 year olds elsewhere on this website. The Safetots Balance bike offers a good range of features for the price, with rubber handlebars to protect little hands, a ‘horse shoe’ saddle for comfort and mud guards which look great! The rubber tyres have a high spec tred, so this does reduce the risk of skidding and means the bike can be used indoors. At a price of just £30.95, the Safetots balance bike is great value and a very good competitor for the Chicco Red Bullet Balance Bike which is the market leader in this price range. The bikes are very different though, as the Chicco Red Bullet Balance bike is much smaller and more suited for 2 year old riders and the Safetots Balance bike would be a great buy for children aged 3 or 4 who are just taking to the saddle. The bike is available in blue or pink, and don’t forget the essential accessories such as a protective helmet when getting your children learning to ride! If your child loves superheroes, then this balance bike from Safetots could be for you! 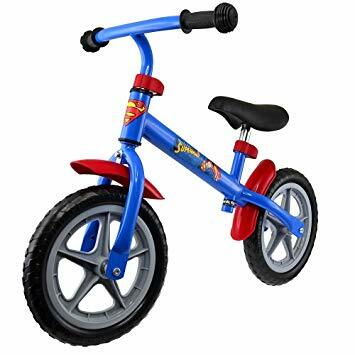 It offers all the same features as the Safetots Ultimate Balance Bike, but with one important difference and that is that the frame has been decorated in full Superman regalia! This includes the Superman logo on the frame as well as the mudguards which have been painted a bright red to incorporate the superhero theme. As with the Ultimate Balance Bike, the minimum seat height is quite high at 39cm so this bike would be best for 3-4 year olds learning to ride. Available for £49.95, this bike will definitely be popular with comic lovers!